This could technically be considered a Thanksgiving recipe. Caramel Roasted Acorn Squash would be a delightful substitution for sweet potatoes or yams at the Thanksgiving table. When it comes down to it, they taste very similar. I suppose pretty much all the squashes or sweet potatoes taste the same when drowned in sugar and butter. You could even top with some marshmallows to get the full effect. 1. Preheat the oven to 400 degrees and line a baking dish or large baking pan with tin foil. 2. Place the 4 halves of the acorn squash on the baking pan. Brush each of the squash with butter and salt & pepper to taste. 3. Roast for 45 minutes. 4. Meanwhile, in a medium sauce pan melt the butter. Add the brown sugar, corn syrup and salt. Bring to a boil for 4-6 minutes or until the sauce comes together. Take off the heat and set aside. 5. After 45 minutes, take the squash from the oven pock with a fork all over. 6. 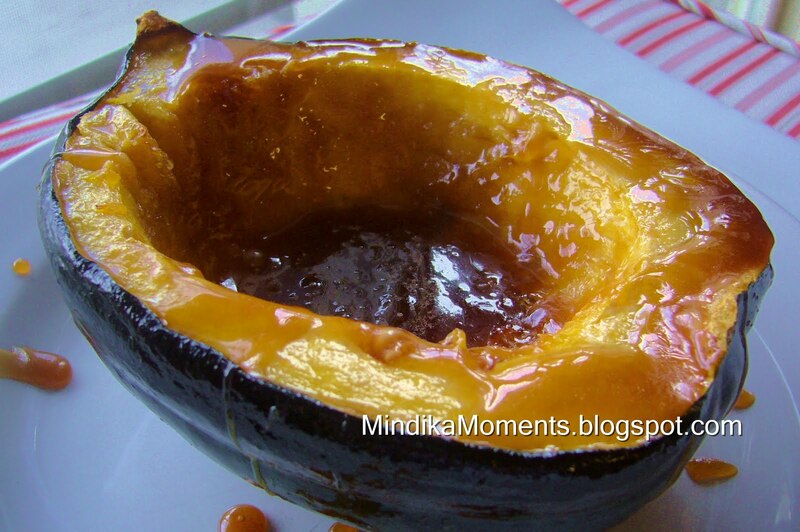 Drizzle the caramel sauce over the squash. Be generous. 7. Return the squash to the oven and continue baking for another 15-20 minutes or until the squash is done to your liking. 8. Serve hole or scoop the squash out of each shell prior to serving. Serves about 4 -8 adults (depends how much squash you like).